I’ve always loved seeing photos of the Obama family’s dogs, Bo and Sunny. They even have their own page on the White House official website! Knowing that most of our Presidents have owned pets somehow humanizes the office of Commander in Chief. Recently, the New York Times featured an article about presidential pets. 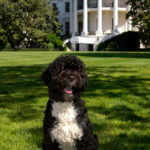 Various dog breeds have occupied the White House, from Labrador retrievers (Bill Clinton) to Beagles (Lyndon Johnson) to King Charles Cavalier Spaniels (Ronald Reagan). Several presidents (Clinton, Carter) have also been owned by Presidential felines. What type of dog hasn’t lived in the White House? A mutt! Here’s hoping our newly elected President will embrace the idea of rescuing a mixed breed dog.